What did your veterinarian say about the vomiting? Spot on- and our pets depend on us to make wise choices for them. If you cant do that or support them when they have a health issue, not a good idea to have them. There is such a thing as pet insurance to help defray costs. Rice is not suitable for dogs and I have no idea why vets always give this advice. Rice dehydrates the body and stick in the intestine of the dog. Huh? Rice doesn't dehydrate human bodies or stick to the intestines of humans. Vets and the AKC both advocate white rice with plain chicken breast for dogs with upset stomachs. It works for my dog (who has an iron stomach, which is surprising for a small breed). Rice in dry dog feed should be a no-go, but that's because it's feed rice, which is really just whatever is left over after they extract the good stuff for human consumption. That is definitely not good for a dog (or human). I agree starrydreamer. Good quality long grain white rice when cooked properly will do no harm. My white rice of choice, however, is Jasmine rice. It's softer and easier to digest. Jasmine or basmati? Basmati rice is often flavored with jasmine - but I don't care for the taste. Regular basmati, however, is often what I give to my dog, too. But in any case, I agree with the advice given here. If you're concerned enough to be posting on a message board for advice about your dog and you're not just attention seeking, then take your dog to a vet and work out a payment plan. starrydreamer wrote: But in any case, I agree with the advice given here. If you're concerned enough to be posting on a message board for advice about your dog and you're not just attention seeking, then take your dog to a vet and work out a payment plan. I don't think many vets will do payment plans. There is a great way to pay for expensive vet bills. Care Credit. If you have a decent credit rating, you can get this payment option. You can get up to 12 months of payment with no interest. Many vets accept Care Credit. So do a lot of other medical practitioners such as dentists, and eye doctors. A lot of insurance companies are now offering some types of pet insurance on homeowners policies. It's not expensive coverage. 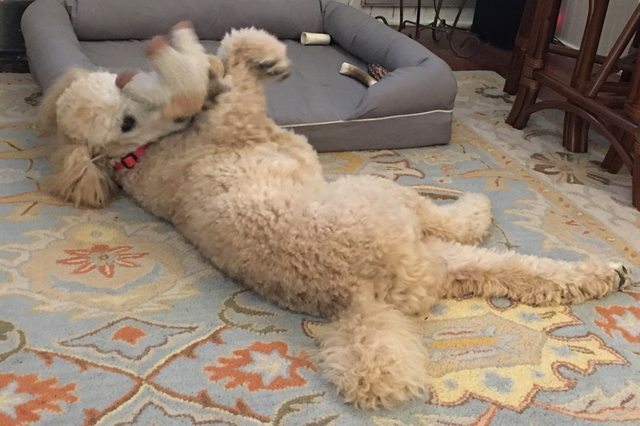 Speaking of pet insurance, does anyone have a recommendation on the best company for that? It's been a while since I looked for policies. So . . . I waited several months after Riley died last year, but the house was too quiet. 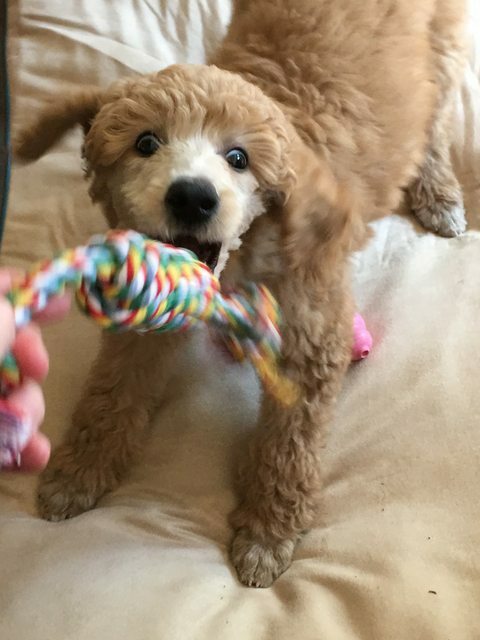 I brought home a new standard poodle puppy in March. Named him Jackson, and he just turned 9 months old. AWW - so sweet. I'm so sorry to hear that Riley is no longer with you. Happy that you went out and got another pup. Ballerina wrote: AWW - so sweet. I'm so sorry to hear that Riley is no longer with you. Happy that you went out and got another pup. Thanks Ballerina. 2016 was an awful year for me and Riley. He had a growth on his spleen that turned out to be benign, but of a type that often turns into hemangiosarcoma. I went ahead with surgery to remove his spleen thinking I might be saving his life. But the %#&^* cancer came and got him in just a few months after that. We had evacuated for Hurricane Matthew and the week after that he seemed lethargic one day. I could tell something just wasn't right but thought perhaps his arthritis had gotten worse. I got an appointment at my vet's office on Halloween and the vet did some tests including an ultrasound. She came back with a shocked look on her face. His liver was just eaten up with cancer. The vet put him on prednisone and he perked up quite a bit for two days, then went downhill quickly. He actually died Nov. 5 on his 12th birthday, as I was driving him to the vet to be euthanized. I still feel guilty for putting my poor guy through that surgery. I've had two dogs die at age 12 from hemangiosarcoma, and one at 14. Those aren't bad life spans for a medium/large-sized dog. 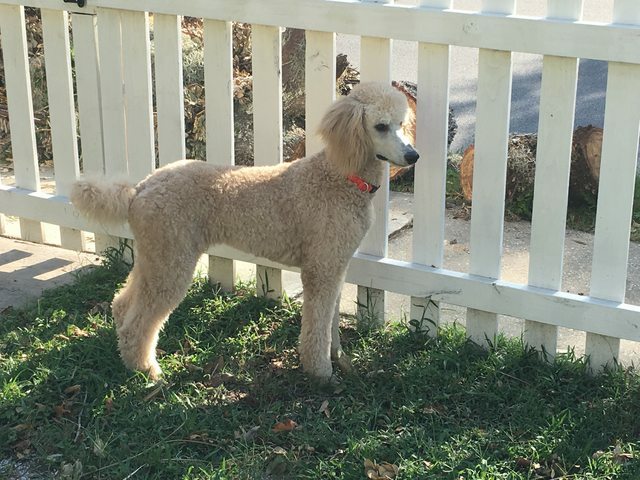 However, our first standard poodle from back in the 70s lived to be 17. 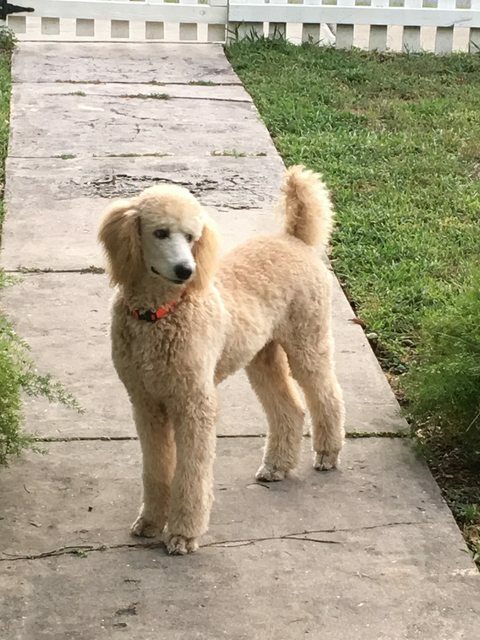 So, with that in mind I started researching to find a breeder who is involved in the effort to outcross bloodlines and breed for a healthy, longer-lived standard poodle. There are no guarantees in life, but Jackson's ancestors seem to live 16-17 years, so I hope he will be around that long as well. I can say he has an awesome temperament . . . high-spirited, mischievous and maybe a little too smart. You sure went through hell, and I am so sorry. We had experience with hemangioma. Fortunately, it worked out well for Roy albeit a good $6,000 later. Here's an article if you'd care to read. Ballerina wrote: You sure went through hell, and I am so sorry. We had experience with hemangioma. Fortunately, it worked out well for Roy albeit a good $6,000 later. Wow, thank you. Good information, and I've saved the article. You're right, knowledge is power. I hadn't thought about asking a vet to do an ultrasound around age 6. In addition to the surgical stuff last year, I had to blend up all of Riley's food for the last year of his life. In late 2015 he had swallowed something sharp, perhaps a stick or even a bone dropped by the hawks around here. The object scraped all the way down his esophagus and partly jammed open the sphincter to the stomach, which caused acid to wash back into the esophagus and create scar tissue, forming a stricture that narrowed the passage to about the size of a pencil. He was put on acid reducer meds, and several months later in spring 2016 he had lost weight from a condition in which he had developed "sludge" in his gallbladder. Which required more meds, and I took him off the acid reducer myself after doing some research. Yes, last year was just sheer hell for both of us. Throw in me moving into my Dad's old house after he passed away and working on fixing that up, as well as renovating some associated rental property that had gone downhill. Ya know, sometimes you have to learn the hell that someone else has gone through or continues to go through to make you stop feeling sorry for yourself. I am so sorry for all you've gone through and condolences also on the loss of your Dad. Ballerina wrote: Ya know, sometimes you have to learn the hell that someone else has gone through or continues to go through to make you stop feeling sorry for yourself. I am so sorry for all you've gone through and condolences also on the loss of your Dad. Thank you. He died in 2015 ... had an apparent sudden cardiac arrest early one morning and I found him in the house . . . perhaps the worst day of my life. I had a disastrous tenant in the home for a while, tossed that one out and moved in myself right before the end of that year. This home was built in the late 1880s and there's still a good bit of work to do. I'm chipping away at it. I read a while back that you have endured some health challenges and I hope you've recovered from those as well. With luck, the rest of this year and 2018 will bring good times for us both. Health challenges doesn't even begin to cover it, but I'm better - not nearly where I used to be, but I lived through pancreatic cancer and that's somewhat of a miracle - not to mention the broken leg which leaves me walking Chester on Gunsmoke and then a fractured vertebrae. The list goes on.. I'm monitored every 6 months until 5 years post surgery for a reoccurrence of cancer. Just had a 6 month CT scan a few days ago. Don't know results yet. I do know that drinking that liquid chalk and having what felt like a Black & Decker drill bit IV needle shoved into my hand was a real beech. Bill keeps telling me, "Toughen up - you're a Marine wife." He's been my rock and so have these two screwball dogs aka The Little Darlings. Yes, surviving that type of cancer as well as everything else you've endured is quite an accomplishment. Bill has the right perspective, lol. And dogs definitely help to get us through tough times. They just know when you need to pet them!